There are several gold dimes out there, but there is only one official gold dime minted by the US government. Any other gold dime out there is gold plated. Is Your Coin Real Gold or Gold Plated? 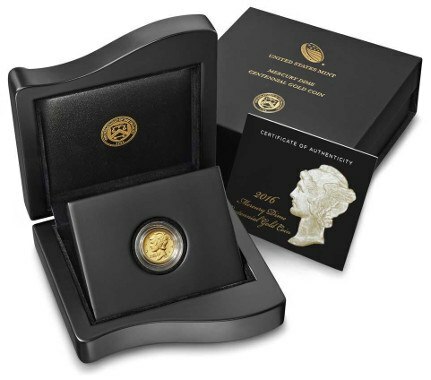 The only official gold dime in existence is the Mercury Dime 2016 Centennial Gold Coin. The United States government only minted 125,000 of these coins and they sold out quickly. This coin is .10 troy ounces of 24 karat gold. It's a beautiful dime that features the old Winged Liberty design, instead of the modern Roosevelt design. The graded coins in good condition sell for around $250. 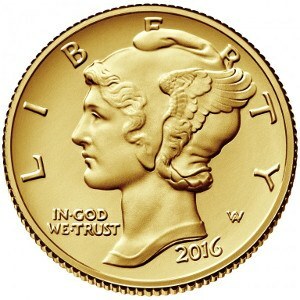 If you plan to buy one of these dimes then make sure to buy from a reputable dealer. You can no longer buy this coin from the government because they only sold a limited amount in 2016. If you find one randomly then you may think you have a rare coin. But a gold plated dime is neither rare nor collectible. There are a few different types of gold plated dimes and we will detail them below. On April 3rd 1997, the telephone company Sprint placed 1,000 gold plated dimes around the country. They called it the Amazing Sprint Sense Find and it was done as a marketing campaign. If you found one of their coins then you could call in and earn a cash prize. The campaign happened a while ago but it's possible that some coins could still be unclaimed. According to Sprint's original press release, people that call in after the first 11 callers can exchange their dime for prepaid long-distance phone credit. But according to one Sprint representative, they no longer honor the deal. You can find the response here. However this response was from a low-level employee and Sprint has not made an official statement on the matter. If you found one of their dimes that hasn't been claimed yet, then you should try and get a reward. The best course of action would be to call Sprint's customer service number and ask to speak to a manager. How can you tell if you have one of Sprint's dimes? We're not sure since we couldn't find any pictures. However there is probably some unique number stamped on the dime, but that's only an assumption. Anyone can create a gold plated dime. All it takes is a gold plating kit and some free-time. There are probably scammers out there that create gold plated dimes and then try to pass them off as real gold coins. But not all of these coins are created for nefarious reasons. There are also dimes that are gold colored and not plated. Athough uncommon, dimes like these could be created as part of a science experiment. In addition, a gold colored dime could be created completely by accident. A regular clad dime could be exposed to harsh chemicals and change color. This rarely happens but it is possible. Note that it's illegal to deface US currency. But if you own a gold plated dime then you likely wouldn't get into any trouble. You would only get in trouble if you started a fraudulent business selling defaced coins. How Much Is a Gold Plated Dime Worth? It's only going to be worth $.10, the actual price of a dime. Some banks or businesses might not even accept it, and they don't need to accept it because the coin has been altered. The gold plating only adds a few pennies worth of gold. It's actually really easy to tell. The real government issued coin is dated 2016 and has the Winged Liberty Design. Of course there will be fakes so another easy way to check is by doing the 'weight test'. The real gold dime will weigh exactly 3.110 grams. A regular clad dime will weigh 2.268. In order to do this test you will need a small gram scale. The only real gold dime is the 2016 Centennial Gold Coin issued by the US Mint. Any other gold dime is not going to be worth more than $.10. If you think you have the promotional Sprint gold dime then call their customer service number and see if you can get a reward.